This post is part of a series in which ladies on the road offer a review of their backpacks. Today’s review comes from Jessie Festa. Hey all! I’m Jessie Festa from the travel sites Jessie on a Journey and Epicure & Culture. I’ve always been interested in experiential travel and discovering lesser-known adventures around the world. In the past some of my top travel adventures have been studying in Sydney; backpacking Europe, French Polynesia and South America solo; exploring the tropical islands of Okinawa in Japan; doing orphanage work in Ghana; teaching English in Thailand; and hiking my way through Southern China. Most recently I got my first taste of Middle Eastern culture in Jordan, which was amazing and really shattered many of the preconceived notions I had about the Middle East. As for my next trip, I leave for Taiwan tomorrow for a cycling-focused adventure. Funny story, about five years ago my mom bought me a backpack for Christmas so I could backpack Europe. It was extremely uncomfortable and way too big for me, but I was inexperienced and figured that must be how backpacks were supposed to feel. About a week into my trip I couldn’t take the discomfort anymore and ran into a tiny shop in Dingle, Ireland, that sold only one backpack. It fit like a glove. I still use it to this day. It’s a Wilderness 55 by Gelert. You can get one on Amazon for about $70. >> Check out prices for the Gelert Wilderness 55 on Amazon UK. I got it about five years ago and have traveled all over the world with it — two separate backpacking trips through Europe, backpacking through South America, South East Asia, China, Hong Kong, Mexico, Ghana, Morocco, Colorado… I actually didn’t bring it on my most recent trip to Jordan and regretted it because there were a few times when I went camping and had to drag my suitcase through the mud and dirt. As I said above, I think it was fate that brought my backpack and I together. It just fit so comfortably, and I think that’s what is most important, especially since you’re going to be lugging the thing on your back quite a bit. Tip: Make sure it fits snug around your waist and has a cushioned back, shoulder staps and hipbelt. Moreover, make sure it fits your torso length (you can ask someone to help you with this at the store) and that the top of the backpack doesn’t make your head tilt forward like a turtle. >> Wondering how to pick a backpack? We’ve got you covered there so you don’t end up with an uncomfortable first pack like Jessie’s. Along with it being comfortable, I love the fact it has many different storage compartments and hidden pockets to help keep my belongings organized. The one downside is it’s a top loading bag, meaning every time you need something that’s on the bottom of the pack you need to take everything else out. I’ve never tried a front-loading/panel-loading bag, but if I bought a new backpack I think I would try this option. It’s extremely cushioned, with padding on the back, shoulder straps and hipbelt. Moreover, it’s designed to create a decent breeze between your back and the backpack to help eliminate back sweat (a very real concern when you’re backpacking in the summer!). All the straps are adjustable, too, so if something feels tight or loose it’s pretty easy to fix. To be honest I’m not sure. It’s not huge but in my opinion its length would take up way too much overhead bin space to not be seen as rude. Just right. I’m a light packer by nature, but I’ve easily packed for three seasons (summer, fall and mild winter) in this one pack without a problem. About the author: Jessie is a travel blogger, born and raised in New York, who has since found herself studying in Australia, volunteering in Ghana and teaching English in Thailand. You can follow her eclectic adventures on her blogs Jessie on a Journey and Epicure and Culture, as well as on Twitter and Facebook. 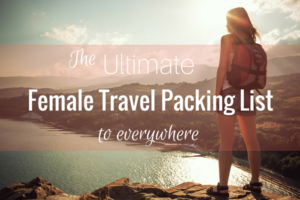 >>See the best travel backpacks for women on Her Packing List.